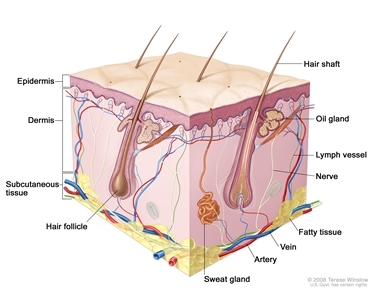 Squamous cells: Thin, flat cells that form the top layer of the epidermis. Cancer that forms in squamous cells is called squamous cell carcinoma. Basal cell carcinoma and squamous cell carcinoma are also called nonmelanoma skin cancer and are the most common forms of skin cancer. 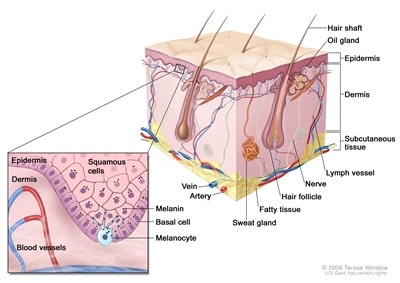 Most basal cell and squamous cell skin cancers can be cured. In the United States, the number of cases of nonmelanoma skin cancer seems to have increased in recent years. The number of cases of melanoma has increased over the last 30 years. Part of the reason for these increases may be that people are more aware of skin cancer. They are more likely to have skin exams and biopsies and to be diagnosed with skin cancer. Over the past 20 years, the number of deaths from melanoma has decreased slightly among white men and women younger than 50 years. During that time, the number of deaths from melanoma has increased slightly among white men older than 50 years and stayed about the same among white women older than 50 years. Being exposed to ultraviolet radiation may increase the risk of skin cancer. Anything that increases your chance of getting a disease is called a risk factor. Having a risk factor does not mean that you will get cancer; not having risk factors doesn't mean that you will not get cancer. People who think they may be at risk should discuss this with their doctor. Being exposed to ultraviolet (UV) radiation and having skin that is sensitive to UV radiation are risk factors for skin cancer. UV radiation is the name for the invisible rays that are part of the energy that comes from the sun. Sunlamps and tanning beds also give off UV radiation.